Just came in today, my first pieces of 44 webbing. It’s all Brit stuff except the ammo pouches. All 45 dated. Unfortunately it has two right side pouches. I’m on the hunt for a left and a set of braces if anyone has any. The two large pouches are actually Canadian P'51. You can even see the post war broad arrow stamp in the fifth photo. Otherwise, it is nice stuff. Apparently the water bottle carrier is difficult to find. The only 44 pattern webbing I have is a frog for my jungle carbine. Nice stuff, how late into the 1970's did the Brits use this? Your items are fairly common. The canteen is the second pattern with a cord tie on the cap as versus a chain tie on the first version. Is that a compass pouch or revolver ammunition pouch? There are two versions of this set. 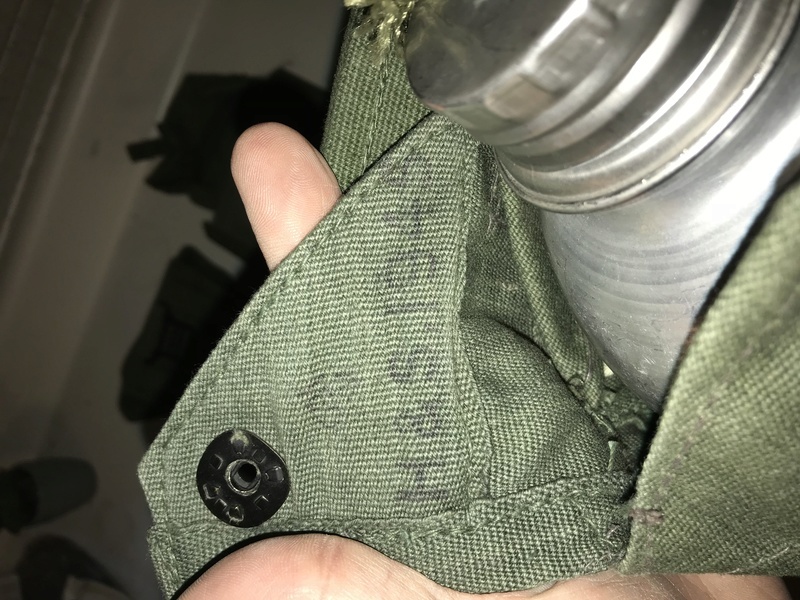 The second version ammo pouches are similar to 51 Pattern in that they have two sets of loops for carrying the pouches high or low on the belt and are a bit larger. 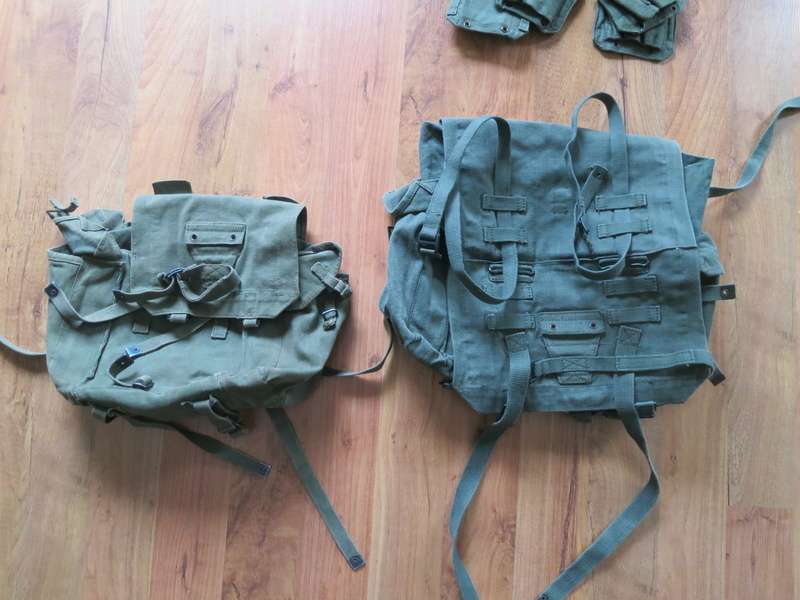 The second version haversack is larger than the first. The holster was issued for the .38 Enfield, later the Canadian 51 Pattern holster was used with the 9mm Browning until the Brits made their own (58 Pattern). As far as I know, there was not a 44 Pattern holster for the 9mm Browning. As mentioned in one of the replies, there is a bayonet frog. This pattern introduced the loops on the ammo pouch for carrying the bayonet. My understanding is the separate frog was issued for use with the old long blade bayonets as used on the Lee Enfield No. 1 Mk.1's. You will see photos of Gurkhas with this frog sans bayonet. Radio webbing was used with the WS88 and the WS31. The unobtainium items are the locally made pouches for the 30 round M1 carbine mags and the haversack. You will come across items usually canteen covers and some ammo pouches that are a different colour of green. These were apparently made for the Indian army. If I can work out how to post photos, I will send some photos of my items. 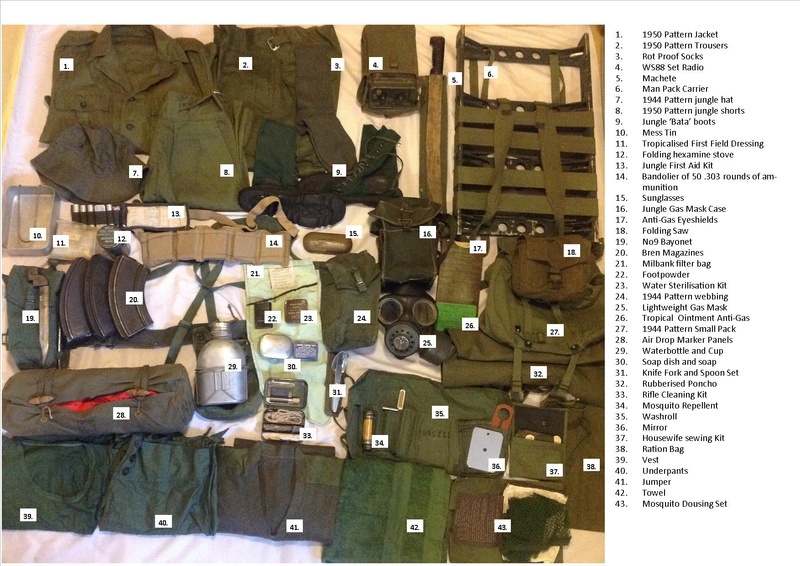 ocdserver, I agree that the 88 set sits in its (special) pair of '44 Pattern pouches (I'm looking at mine now, a black faced mortar set and aerials in the left, battery, accessories and instruction plate in the right) but can you elaborate on the 31 set? I thought it was mounted in the aluminum frame 'Carrier, G.S." with its Satchels, Signals strapped in below it. 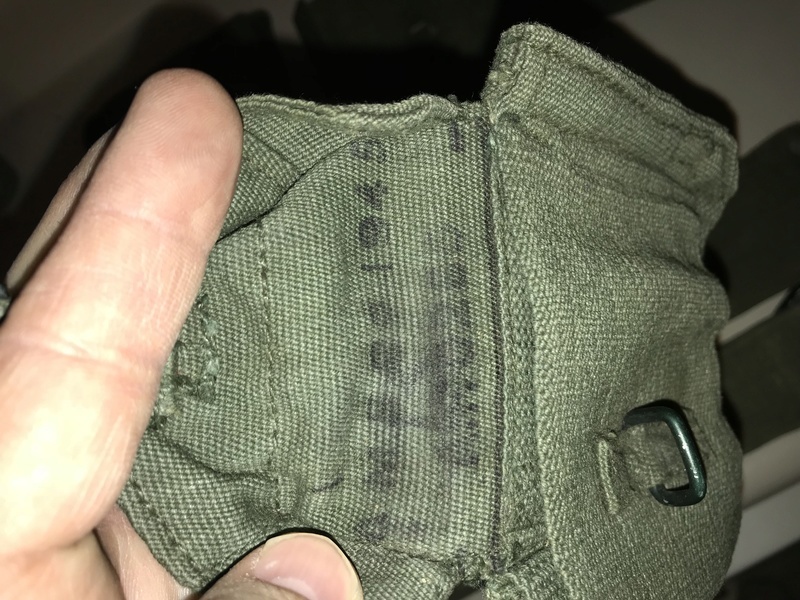 Was there a web harness used to attach the 31 set to '44 Pattern web? You are correct. I called it 44 Pattern webbing as the frame was introduced with the 44 Pattern set. The WS31 sits on the frame with the equipment haversacks and the antenna bag strapped on. I will post photos of my set. The issue with the frames was paint did not adhere to the aluminium. All the frames I have seen are not primed, just painted with finish coat. This problem was not adequately resolved until the US came out with there anodized frames. Really beautiful to look at, but not so nice with a shiny finish to the paint. Also, when used with a radio, the frame has a support leg what looks like a big spike. 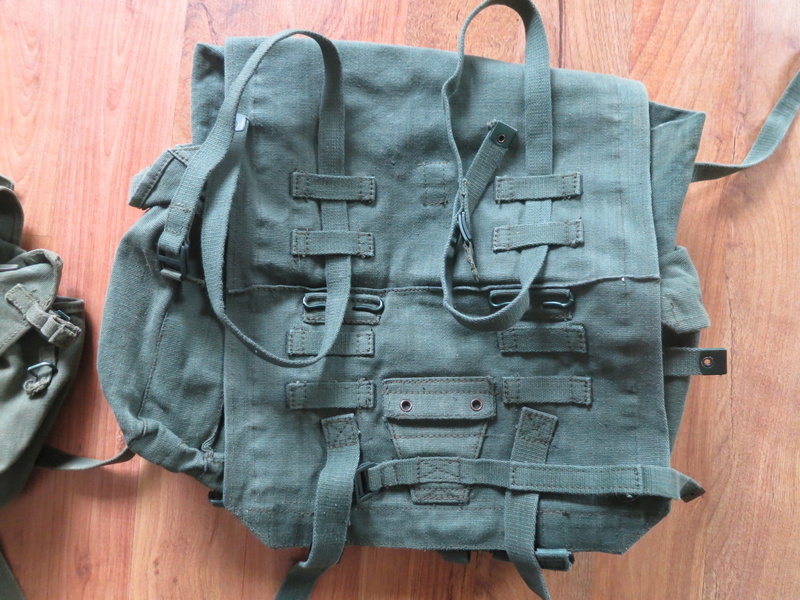 I posted three photos of the 44 Pattern haversacks. Now I have to see if they are on this thread. I am having issues with posting my photos. I received an e-mail telling me I have an account with servimg.com and was given my login and password. However, I cannot log on as it won't accept my info. I changed the given password to my CMCF password and still cannot logon. Due to this I cannot get through the posting a photo tutorial. Here are some photos of the 44 Pattern webbing. 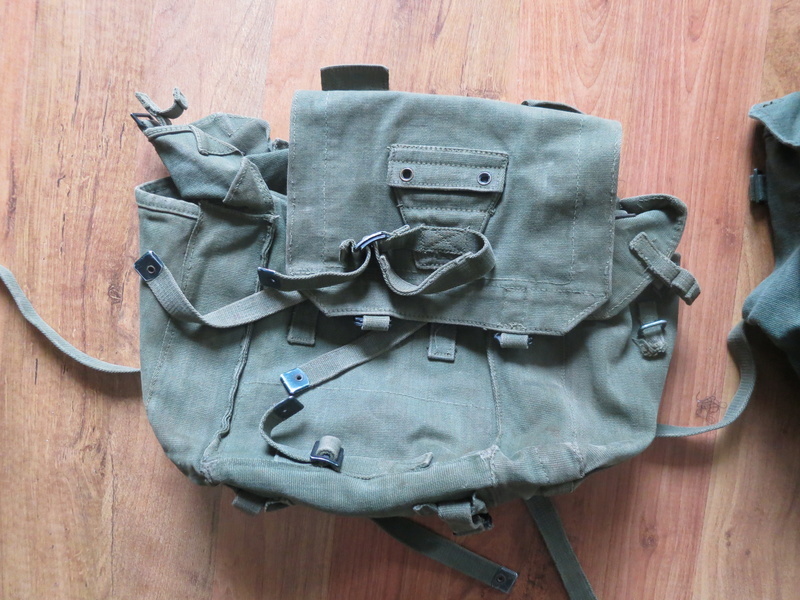 I am moving to the rest of the photos to the Commonwealth Militaria Forum. I didn't get that involved as I have too many different sets dedicated to the RTO. 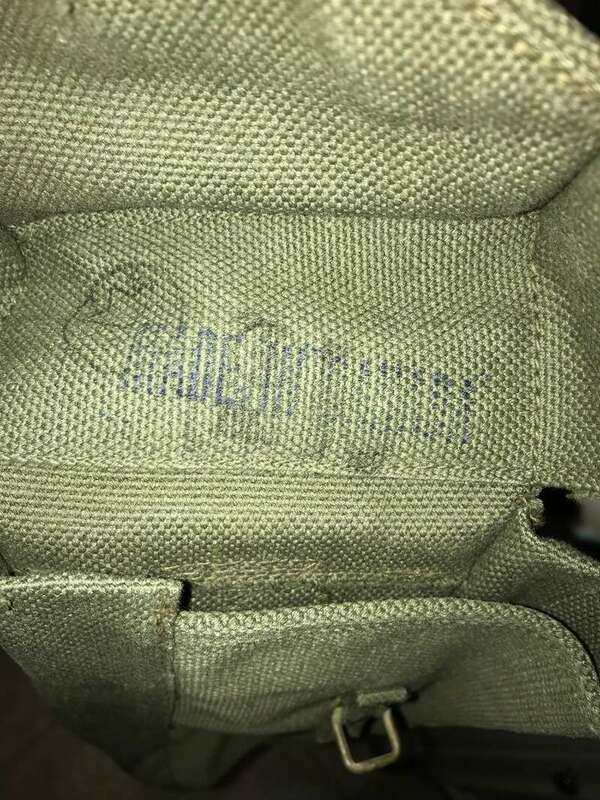 Two observations: 16, jungle gas mask case. Is it the same as the lightweight case that came out near the end of WWII? I don't recall a gas mask bag specifically for the jungle. 19: I have seen an illustration with this attached to the separate frog, but with annotation saying the No. 9 could also be attached to the left side ammunition pouch. I have both early and late ammunition pouches and a SLR bayonet scabbard will not fit on the first version ammunition pouches. Assuming the bayonet scabbard is the same size for the SLR and the No. 9, does a No. 9 scabbard fit in the first version pouches? The jungle respirator case is identical to the standard lightweight case except it is in a much darker shade of green. It is also a lot harder to find! 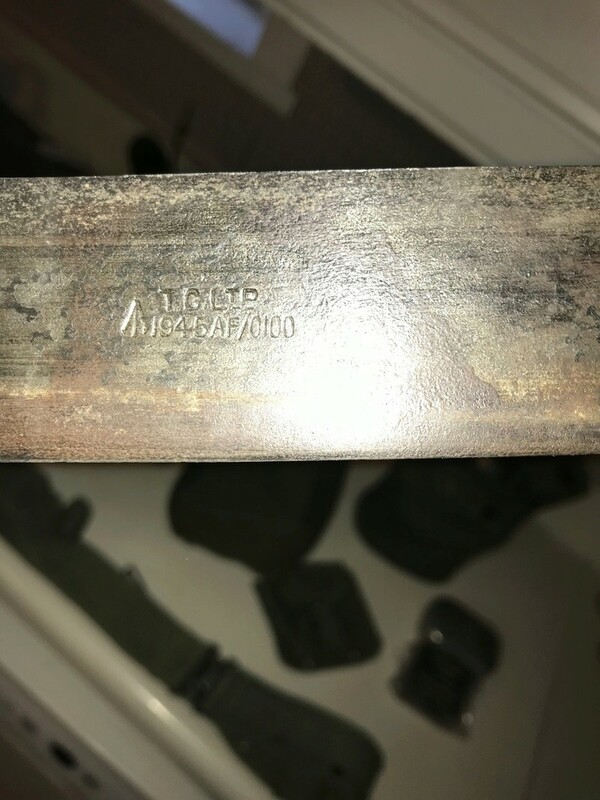 Off the top of my head, I believe my pouches are 1945 dated and yes the No9 bayonet scabbard does fit in the side of them. It uses the same scabbard as the bayonets for both the No5 Enfield and the British SLR so I am not sure why yours doesn't fit, you may just have got an odd pouch that was made a little wonky. Right you are! I just gave a little shove and the SLR scabbard did fit. My first version pouches are dated 1964, are marked R and L (I wonder is this was a carry over from the WS88 pouches being stamped R and L?) and have CN numbers. The second version are dated 1967 are not marked R and L and have NSN numbers. My driver's pouch is dated 1954 and has the CN number. I always wondered what the date for the introduction of the second variation was. 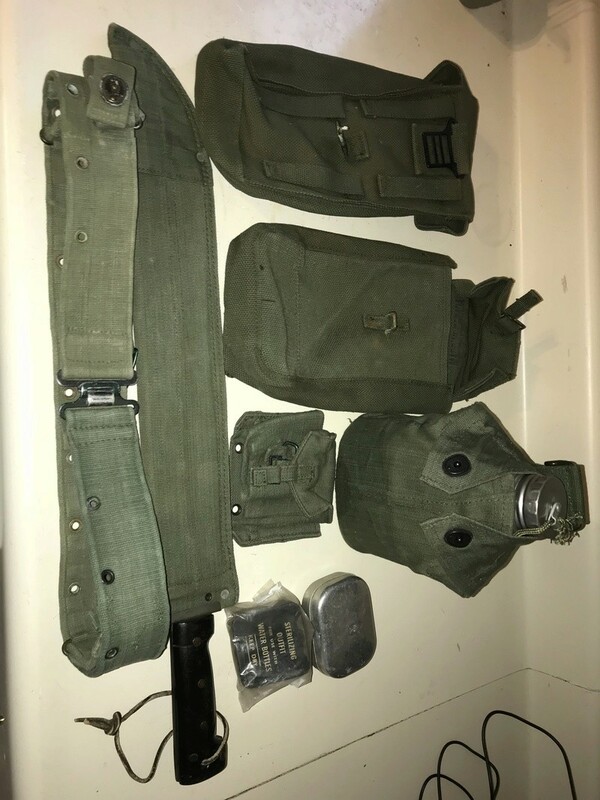 Especially when the 58 Pattern was in general usage starting around 1960 and the ammunition pouches on this set were designed to be worn low on the belt. The driver's pouch is manufactured with two different JG dyed webbing. It is Finnegans and for some reason I associate this manufacturer with these pouches. 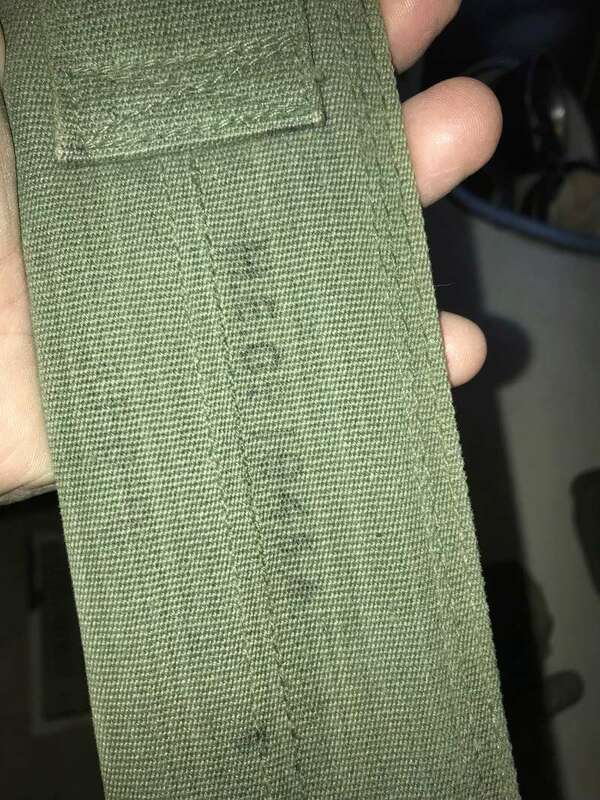 I left a couple of messages on your blog regarding the 51 Pattern belts and the radio carriers. I will send you some photos of the carriers. Is there a way to do this through your blog? Hi Ian, unfortunately the comments section wont take pictures. if you email me on e.hallett@hud.ac.uk you can send them to me that way.